SARASOTA, Florida -- Mote's melt-in-your mouth Siberian caviar has been getting rave reviews since the first exquisite batch was produced in eastern Sarasota County in 2006. Now, Florida connoisseurs have a new source for this undeniable delicacy: Whole Foods Market�. The caviar � being sold under a joint label with gourmet food distributor Marky's � is available just in time for the holidays in each of Whole Foods Market's 16 Florida stores. "At Whole Foods Market, not only do we bring our customers the widest selection of the highest quality natural and organic items possible, but we always start our search for these items locally," says Joey Wells, Regional Specialty Coordinator for Whole Foods Market Florida Region. "When we first heard of this fabulous caviar being produced right here in Florida, we knew immediately that we had to carry it in our stores." Most Florida Whole Foods Markets will carry the product year 'round, but if you don't see it in your store, they'll be glad to special order it � and it is even featured on the grocer's holiday menus this year. Whole Foods Market's farmed seafood standards have made them a leader in the industry and were created after an intensive two-year process that included conducting extensive research on fish farming, review of all the best available science, consultation with the top environmental organizations and visits to farms worldwide. That focus happens to line up perfectly with Mote Aquaculture Park's mission of developing sustainable fish farming technologies that help lessen the pressure on wild fish stocks and increase food security in the U.S. "Our missions intertwine nicely � we're just a perfect fit," says Jim Michaels, manager of Mote's Siberian sturgeon program. As a nonprofit organization, proceeds from product sales support all of Mote's research and development efforts. Mote caviar and sturgeon meat is produced on a state-of-the art modern farm located in eastern Sarasota County that focuses on developing and perfecting the ability to re-use water to grow food fish in order to minimize the farm's environmental footprint. Mote also follows strict food safety guidelines. -Controlled Environment: Mote sturgeon (Acipenser baerii) are grown indoors where all parameters � from diet to water quality � are strictly controlled, allowing us to produce caviar with a consistent flavor and quality. 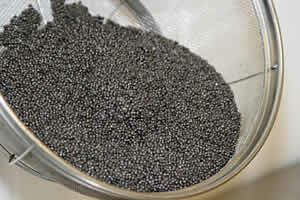 -Food Safety: Mote caviar and sturgeon meat are produced in accordance with all Country-of-Origin Labeling standards and are classified as U.S.-produced, meaning that our caviar is hatched, raised, harvested and processed in the U.S. Our growth and production techniques follow strict state and federal regulations. -Water Re-Use: Some aquaculture facilities may use "new" water as quickly as every 5 to 7 minutes. Technology in place at Mote allows us to clean and re-use water for 5 to 7 days, protecting a precious natural resource. The retail price for the Mote Caviar is $55 an ounce at Whole Foods Market. Whole Foods Market customers also have the opportunity to taste and learn more about caviar � including Mote's � during a Caviar Education Program being taught by Marky's at the stores during November and December. The one-to-two hour classes offer background information on caviar production and products and include tastings of American and imported farm-raised caviars. Caviar Classes are a mere $5, with proceeds being donated to Mote.